Speaking of pottery means speaking of the ancient history of the land of Sardinia. Doubling as craftsmen and artists, Sardinian potters have always existed, from the pre-nuragic era to this day. Throughout history, the activity of pottery is intense: from the crude mixtures of clay dating back six or seven thousand years before Christ, to the unique and exceptional items used as interior decoration. Sardinian ceramic reveals the story of a people who began producing pottery with “simplicity” in order to meet basic needs, and was able to refine this style and be distinguished, with elegance and taste, to the point of being recognized and attracting widespread attention. In the remote region of Cagliari, known as the Sardinian “Faenza”, the ancient art of pottery has particularly developed over the years. Here, a number of shops have been transformed into genuine laboratories, and every day pieces of great value are baked. The creation of ceramics has become much more eventful – each group of houses, each tiny village has its “master” potters particularly skilled in shaping kaolin clay, which is found in large deposits throughout the island. With these materials, it is possible to make anything, but they are especially molded to make pots and jugs for storing food and water. As the perfect container for keeping fresh water in a particularly sunny land, the pitcher has long been the authentic symbol of the potters of Sardinia. 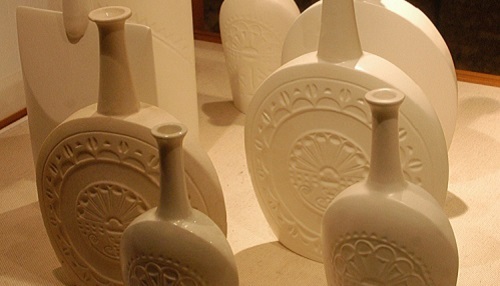 Sardinian ceramic artisans have managed to win the challenge proposed by the consumer society. Faithful to their ancient origins, but able to enjoy their creativity in modern creations, these potters have succeeded to modernize the Sardinian style with respect to an ancient tradition.